Since 1895 Fiebing's has researched better ways to dye. 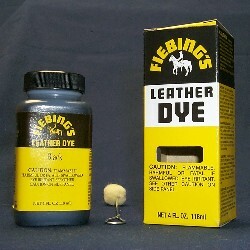 Fiebing's Leather Dye is the most recognized penetrating alcohol-based leather dye in the world. This dye is also used to add color to other mediums such as gourds. It is easy to create interesting middle tones, by blending the dye colors together to achieve a different shade. Each 4 oz. bottle includes one wool dauber. See the color chart by clicking below. We carry many of these colors, and as stated, you can mix them to create a shade you desire. CLOSE OUT SALE! YOU WON'T FIND A BETTER PRICE!